For a recent 4-H project, I decided to have my kids make a simple motor. The project uses a derivative of battery holder that I created and modified to make into a Continuity tester for an earlier project. 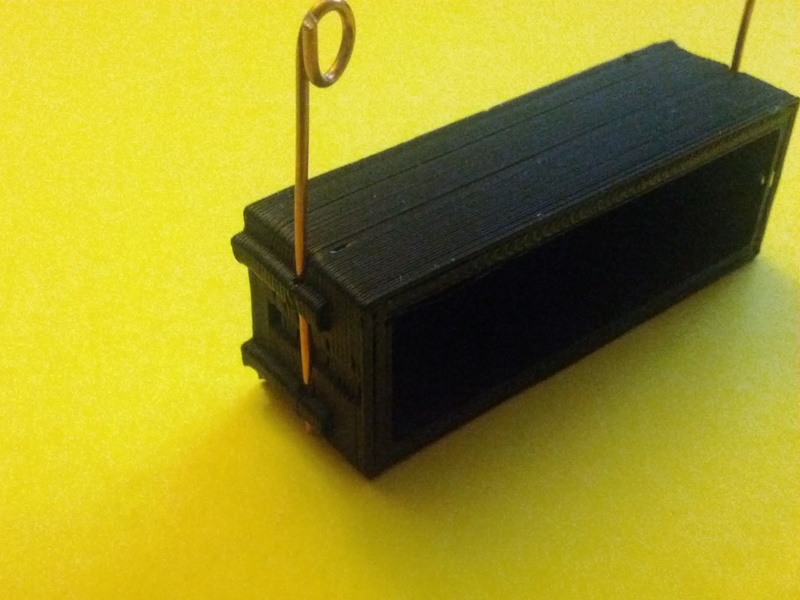 The item is Thing 18354. 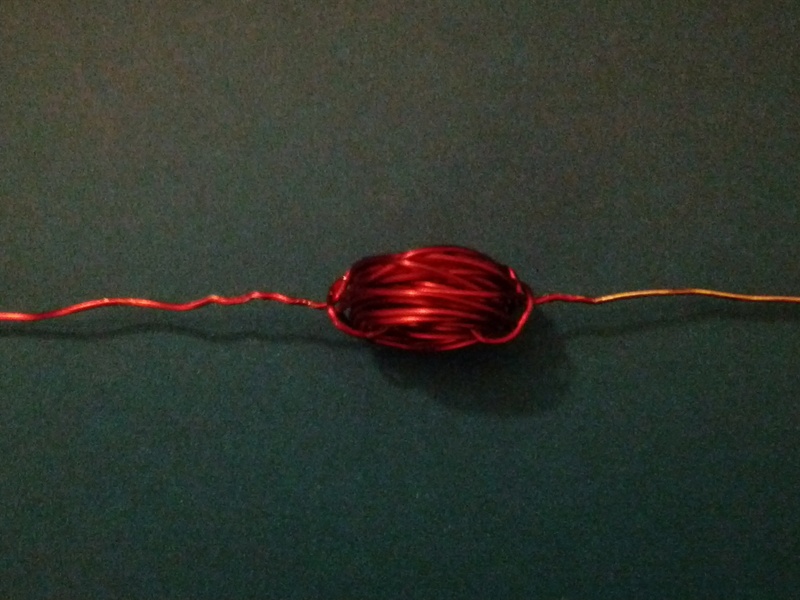 The first step is to take about a 2″ piece of stripped, 22ga solid wire and make a single coil in order to hold the rotor. Do it twice. 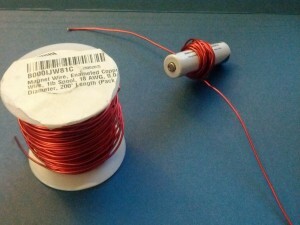 These will support the spinning rotor and conduct electricity to it. The next step is to use a small gauge wire to make the battery contacts (see the side of the holder here, and refer to this earlier post for more detail). The new thing has slots in either side to hold the rotor arm supports and make contact with the battery (without soldering). 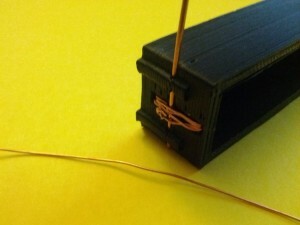 Make sure the battery contact wire is pressed well against the rotor arm support on each side. Put a battery in and use a multi-meter to make sure that the contacts are providing electricity through the rotor supports. 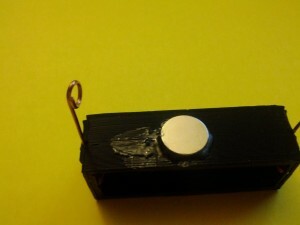 Glue a permanent magnet centered onto the top of the holder. 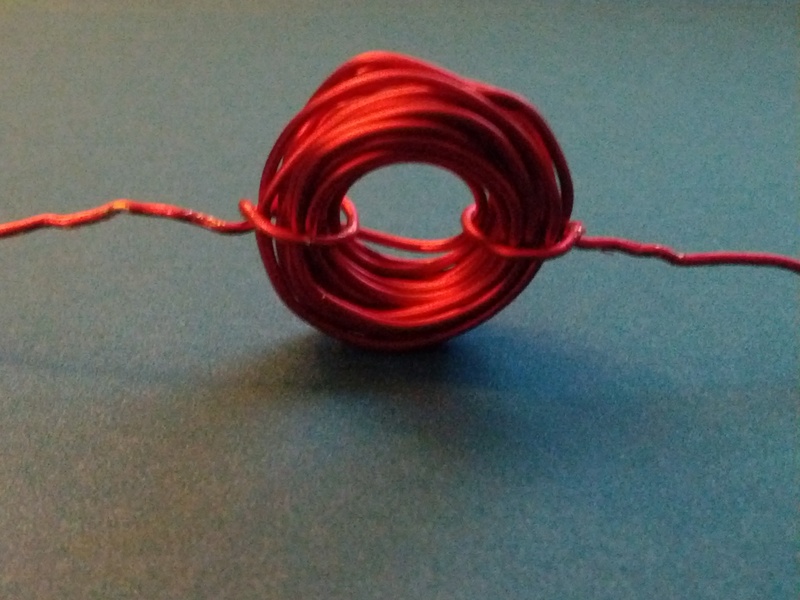 I used powerful, thin, Neodymium magnets. Now we make the rotor. 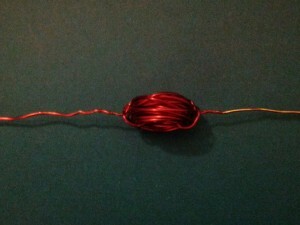 Take about 3 feet of enameled wire (motor wire/magnet wire) and coil it up around a AA battery. 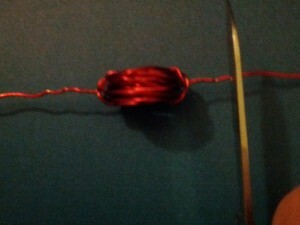 Leave a few inches on either end to use as the arms.Wrap the end of the wire around the coil to hold it tight. 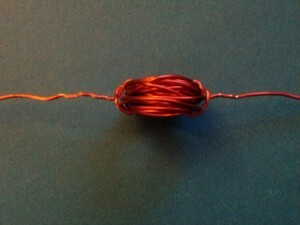 Try to ensure that the free end of the wire is straight and centered on its’ side of the coil. 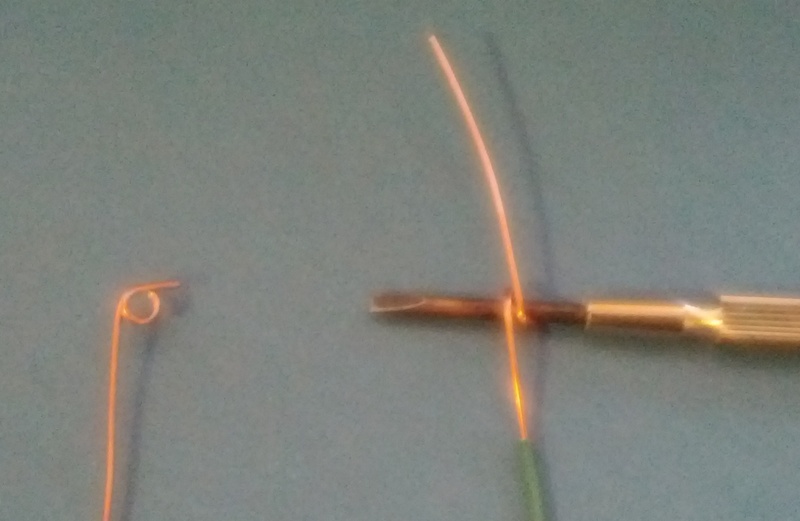 Once the coil is complete, hold it against a surface, like the edge of a table or workbench, and scrape a bit of the enamel off of the wire. Be careful not to scrape too much off. 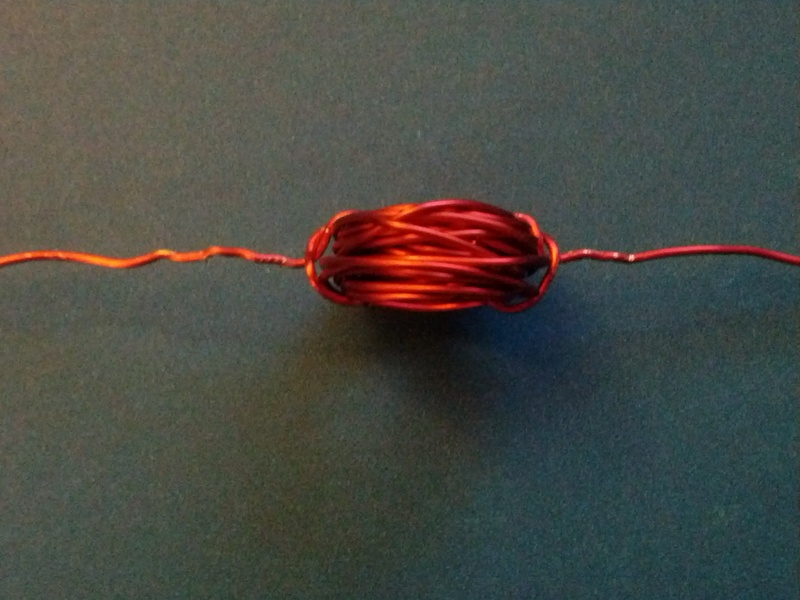 It needs to be 1/2 of the circumference of the wire or less. Do it on both sides. (The pictures just show one side.) If done correctly, when the coil rotates, the exposed part of the wire will touch the rotor supports and allow electricity to pass through the coil, making an electromagnet. This will cause the rotor to spin and pull towards the permanent magnet or push away from it. Insert the coil into the rotor holders. 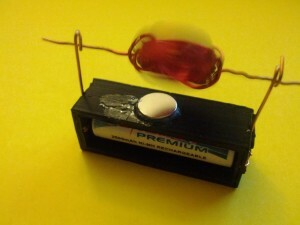 The rotor should spin freely and sit closely above, but not touching the magnet. 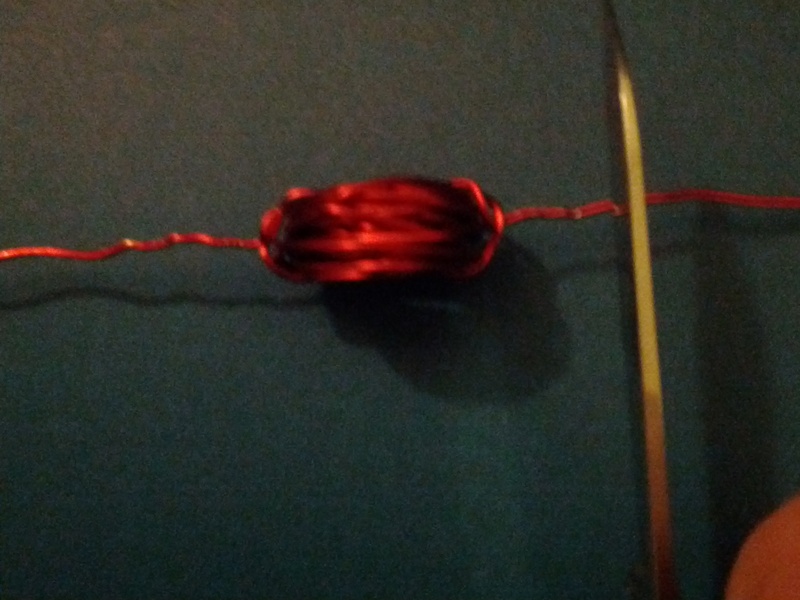 You can bend the ends of the wires a little or use beads to make sure the rotor doesn’t move too far back and forth and slip off of the rotor supports. Gently spin the rotor to start it going. 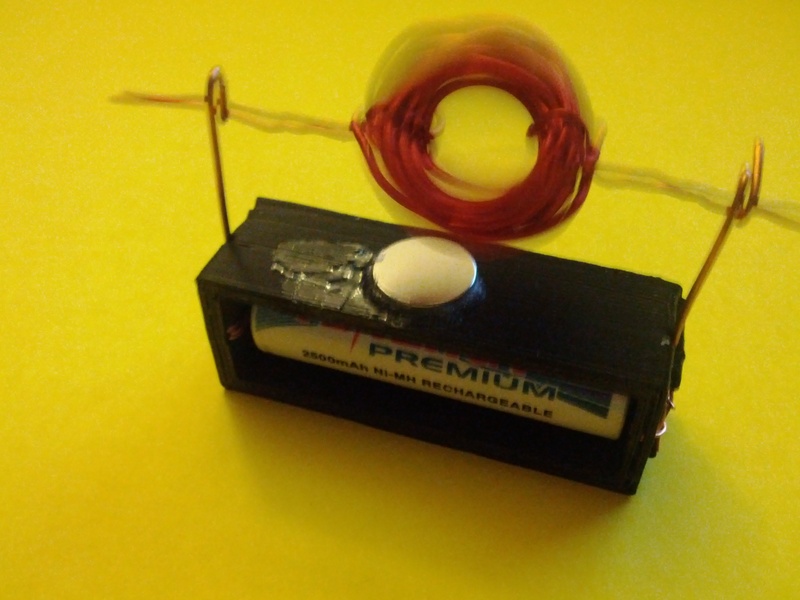 If it doesn’t spin, the polarity might be backwards – replace the battery in a different direction. 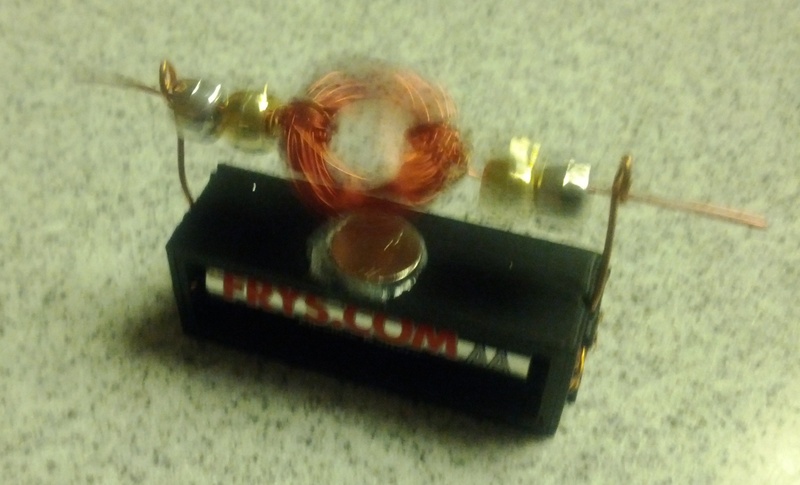 If it still doesn’t spin, make sure power is flowing through the rotor supports (use the multimeter to check). Make sure that the enamel that is scraped off of the coil is perpendicular to the hole in the coil – that is, the coil hole should not be facing up when you see the bare ends of the rotor arm. Also, half of the rotor arm needs to still be insulated. If you scraped insulation off of the complete circumference of the arm, it will not work. This entry was posted in 4-H, Make. Bookmark the permalink. I really enjoyed this 4H project! It was fun to build, and easy too!